Spring is finally here and I have a dessert recipe that will snap your taste buds out of their winter slumber. Japanese Cotton Cheesecake has the texture of a cloud, is light and flavorful, and is irresistible once you drizzle on my homemade raspberry caramel sauce. Sometimes I find that New York-style cheesecake can be too heavy, but you won’t have that issue with this pillow of goodness. 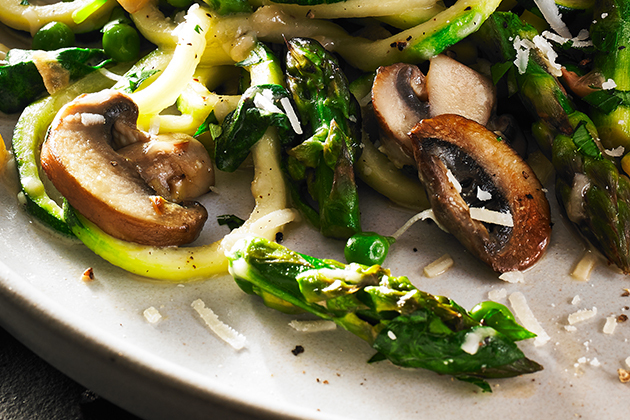 The recipe is easy to make and most certainly a crowd pleaser! First off, you want to melt the cream cheese, butter, and milk over a double boiler. 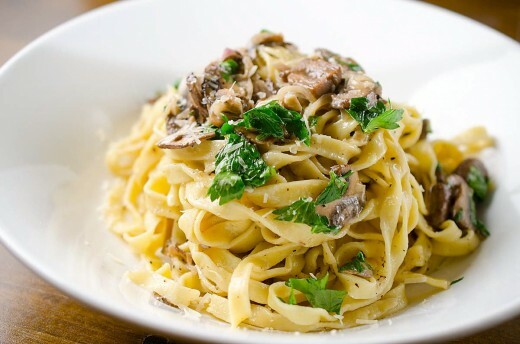 This will only take a few minutes, and then you can whisk it until smooth and creamy. Add the cake flour, egg yolks, and lemon zest to a large bowl. 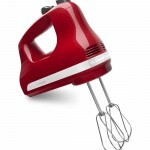 Use the KitchenAid® 5-Speed Ultra Power™ Hand Mixer to thoroughly combine all the ingredients. Make sure you only add 2 egg yolks at a time, which will make the batter smooth and creamy. I found that using both orange and lemon zest adds a real springtime burst of flavor to the cake, and helps cut through the rich cream cheese. Since the Hand Mixer is so powerful, I can easily beat the egg whites to medium peaks in just 6-7 minutes. Start off with the egg whites and cream of tartar, and then add sugar after beating for a minute. The cream of tartar helps stabilize the egg whites making it easier to form medium stiff peaks. The Hand Mixer is also gentle enough to stir chocolate chips and nuts into cookie batters. Gently fold the meringue into the cream cheese batter a little at a time. You want to keep all of the air bubbles that you just created by beating the egg whites. Make sure to use a gentle folding motion until all of the egg whites are incorporated into the batter. Pour the batter into a spring form pan, wrap the sides with tin foil, and place the pan in a water bath inside of a baking dish. Bake for 70 minutes at 325° F. The water bath will ensure the cake cooks gently and evenly. 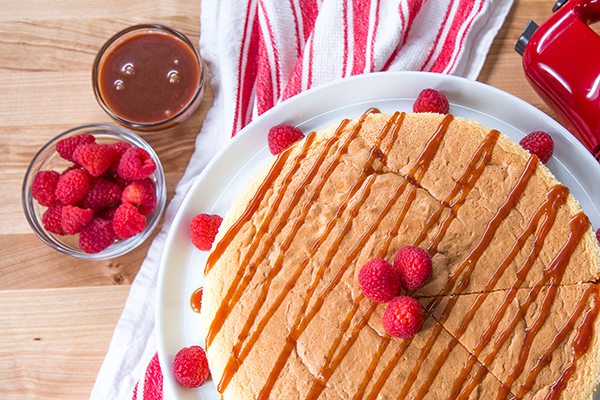 While the cake is baking, you can make the raspberry caramel sauce by adding the raspberry puree to the heavy cream. You can use fresh or frozen raspberries for this sauce. Melt the sugar and water in the small saucepan from the KitchenAid® Tri-Ply Copper 10-Piece Set and then raise the temperature to medium-high for 8 minutes. 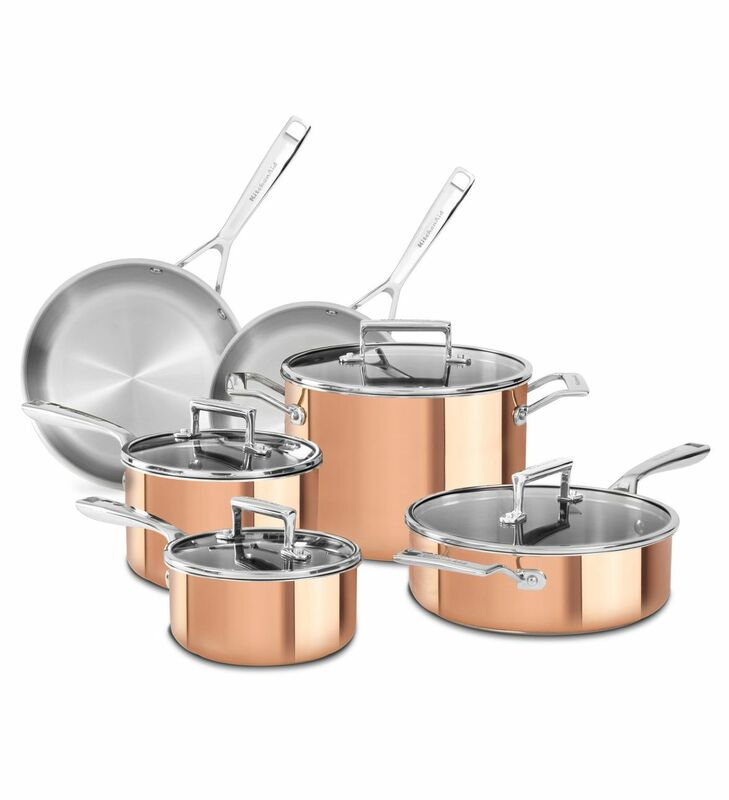 The cookware from the Tri-Ply Copper 10-Piece Set are not only beautiful to look at, but the 3-ply copper design gives you precise even heating, which is crucial to making homemade caramel. Once the sugar mixture becomes amber in color, add the raspberry cream along with the butter and whisk until silky and creamy. Once the cake is ready, let it rest in the oven with the door slightly ajar for 30 minutes, and then let it rest at room temperature for another 30 minutes. When ready, drizzle some of the raspberry caramel sauce over the cake, garnish with some raspberries, and enjoy! Share your take on this Japanese Cotton Cheesecake on Instagram using #MadeWithKitchenAid for a chance to be featured. Position the oven rack to its lowest setting and pre-heat oven to 325° F. Prepare a double boiler by adding 2″ of water to a pot set over medium heat and placing a bowl that fits snugly on top of it. Add the cream cheese, butter, and milk to the bowl. Stir occasionally and allow to thoroughly melt, about 10 minutes. Use a whisk and make sure the mixture is smooth and creamy. Remove from heat and set aside. Allow the cream cheese mixture to cool for five minutes and then sift in the cake flour and corn starch. Use your KitchenAid® 5-Speed Ultra Power™ Hand Mixer to thoroughly combine. Add the salt, two of the egg yolks, and mix well until the eggs are combined. Continue doing this two egg yolks at a time. Add the lemon zest, lemon juice, orange zest, and mix to combine. Set aside. To make the meringue, add six egg whites to a large steel or glass bowl along with the cream of tartar. Make sure to thoroughly clean the Hand Mixer and then beat the egg whites on medium speed for 45 seconds. Add the granulated sugar and mix on high until medium peaks have formed, about 5-7 minutes. Use a spatula to add 1/3 of the meringue to the cream cheese mixture, making sure to fold it in gently. The idea is to keep all of the beaten air in the mixture and not deflate it. Once the meringue is folded in, add another 1/3 of the meringue and keep repeating this process until everything is well combined. Pour the batter into a 9″x2″ spring form pan and use extra wide tin foil to cover the bottom. Bring the foil up to the edges of the pan. Repeat this with one more layer of tin foil. Fill a large roasting pan with 2″ of water and place in the oven. Carefully place the pan filled with the batter in the middle of the roasting pan and bake for 70 minutes, making sure not to open the oven door. You will know the cotton cheesecake is ready when you press down on it, and it feels firm, but bounces back. Turn the oven off, open the oven door a few inches or stick a wooden spoon so the oven won’t close all the way, and let the cake rest in the oven for 30 minutes. While the cotton cake is baking, make the caramel sauce by defrosting the frozen raspberries in the microwave. Place the raspberries in a strainer set over a liquid measuring cup and use a spoon to press as much liquid into the cup as possible. Remove the strainer and add enough heavy cream to the raspberry juice to total 3/4 cup. Add one cup of granulated sugar and 1/4 of water to the small saucepan from the KitchenAid® Tri-Ply Copper 10-Piece Set. Cook over medium heat for six minutes and then crank the heat to medium-high and cook for roughly eight minutes or until the sugar mixture is dark amber in color. Make sure not to burn the sugar (the mixture goes from pale amber to dark amber very quickly). As soon as that happens, turn the heat off and carefully pour in the cream and raspberry mixture. Everything will bubble vigorously, but remain calm and carefully whisk the mixture. Add the butter, salt, and sugar mixture, and continue whisking. Once the bubbling subsides, turn the heat back on to medium-low and cook for another five minutes, stirring often. Remove from heat and set aside. The caramel will thicken up as it cools and will keep in the refrigerator for 5-7 days. After the cotton cheesecake rests in the oven for 30 minutes, place it on the counter and remove it from the spring form pan. 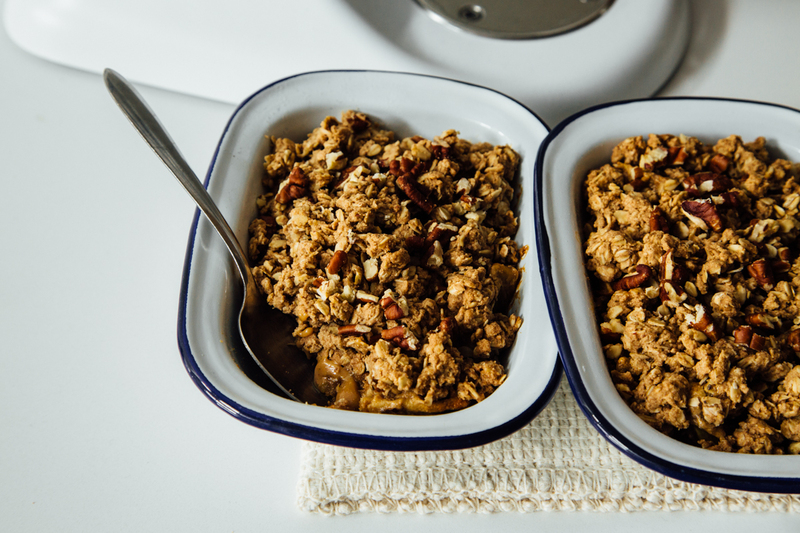 Allow to cool for another two hours or ideally overnight in the refrigerator. When ready to serve, cut as piece and drizzle it with caramel sauce. Enjoy!